Following the recent launch of its new flagship, the Maori 78 called Blackmail, Maori Yacht announces another new tender series, the Maori 30. 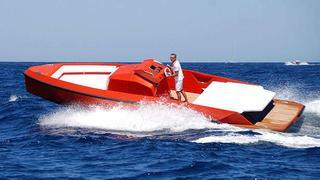 Built in advanced composite materials, the 9-metre Maori 30 is designed by Marco Ciampa. Her modern design reminds us of her previous successful larger sisters. Large sunbeds accommodate guests onboard, and the central console includes a day head. This first hull is powered by a single 370hp Yanmar diesel engine giving a top speed of 42 knots. Another version is possible with a 430hp Mercruiser gas engine. The first Maori 30 will make her debut at the forthcoming Monaco Yacht Show.